Knowing how to peel hard boiled eggs easily can be a real help when you’re in charge of making several dozen Deviled Eggs for a potluck or just like to do meal prep in advance for the week. It’s just so frustrating to find the eggs tearing or getting those unattractive dents, not to mention how time-consuming it can be to get all of the pieces of shell off… unless you know these three tricks. The fresher the egg, the tighter the white clings to the shell’s inner membrane. As an egg ages, the shell becomes more porous which allows air between the shell and the white. In the process, the egg begins shrinking slightly inside its shell which means it won’t cling to the membrane as much. Of course, you don’t want to cook rotten eggs, but those which have been in your fridge for a week or two work best. While peeling, run eggs under water that’s the opposite temperature of the egg itself. If they’ve just been boiled, the egg itself will still be warm so run it under cold water. If you’re peeling previously boiled eggs that just came out of the fridge, use hot water. This temperature difference will cause the egg to shrink back from the inner membrane and makes it easier to peel the egg without tearing it. 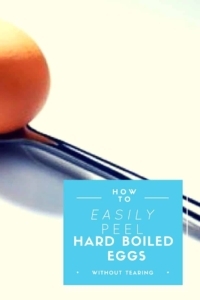 The easiest way to peel a hard-boiled egg is to crack it lightly on the larger end then hold it under water (the opposite temperature of the egg) and slip the tip of a spoon beneath the shell. 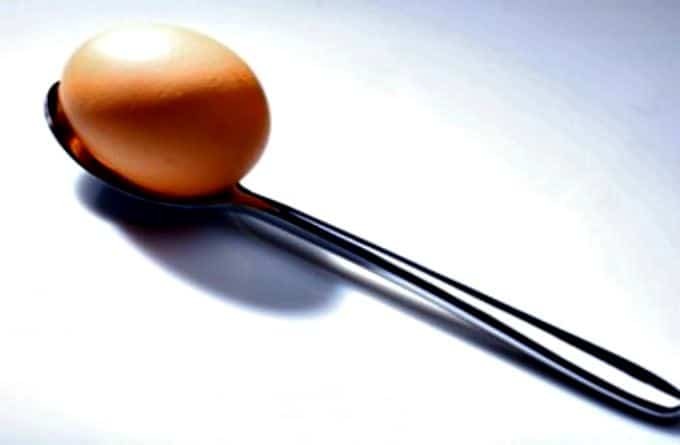 Keep the cup of the spoon facing the egg as you slide it around beneath the membrane and the shell will slip right off. • Don’t throw those shells away when you’re done peeling the eggs, either: try these unusual uses for egg shells. • Made too many? Then try these recipes for leftover hard boiled eggs! • Want a deliciously different treat? Try my Bacon Blue Cheese Deviled Eggs Recipe.